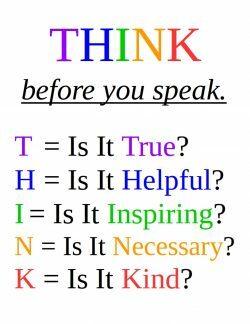 October is National Bullying Prevention Month, a campaign started in 2006 by the PACER Center’s National Bullying Prevention Center. It’s no coincidence that PACER, a powerful voice for families of children with disabilities, has also taken on the cause of bullying prevention. Parents of children with disabilities are very much aware of the possibility of bullying and the resulting damage. 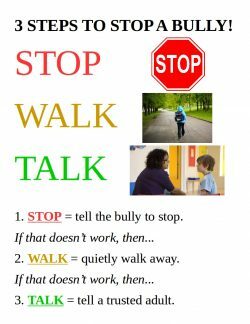 Many – such as myself – have tales to tell of the insidious forms of bullying, a disabled child’s attempts to communicate what was happening and a school’s inability to distinguish between friendly and unfriendly interactions among children. So when I learned that my son’s elementary school wanted to create some type of interactive bulletin board to promote bullying prevention, I jumped at the chance. I knew that the school bulletin board would be right in front of the bench where students line up every day for lunch and for dismissal. I don’t have any illusions about the limits of what a static display can do. 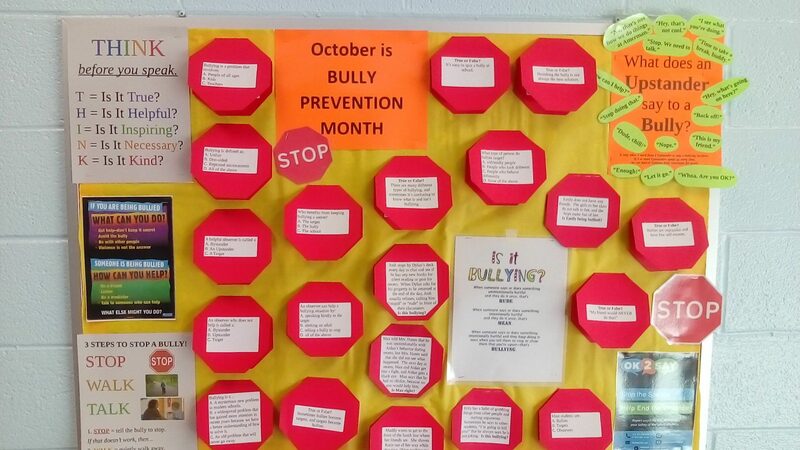 The school already has a planned assembly, classroom discussions, and an established character education curriculum to support Bullying Prevention Month. My hope is for the ideas on the bulletin board to become part of the school’s ongoing conversations. 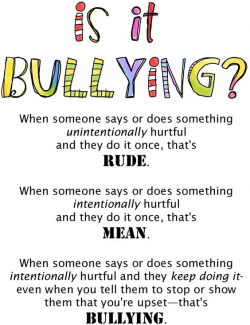 What is the difference between “mean” behavior and bullying? What is the difference between a bystander and an upstander? What can an upstander do or say to intervene in an incident? C. Most students are observers who can choose either to stop or to ignore bullying. What will you choose? B. A person who sees a bullying incident and chooses to stand up to the bully is an Upstander. A. A bystander is someone who watches an incident but chooses not to help. Bystanders are part of the problem because their silence shows that they agree with the bully. D. An observer can help in many ways. Just one word from an Upstander can stop a bullying incident instantly. D. Bullying is a series of unfair, one-sided incidents against a target. A. A mysterious new problem in modern schools. B. A widespread problem that has gained more attention in recent years because we have a better understanding of how to solve it. C. An old problem that will never go away. B. Bullying can happen anywhere, anytime. But we know how to reduce and even eliminate bullying: the key is to work together. A. Bullying is not restricted by age or occupation. Kids can bully adults, and adults can bully kids. Many adults complain about bullies at work! Practicing kindness from an early age is the best solution. 8. What type of person do bullies target? D. Anyone can be a bully’s target. Often the most attractive, kind and smart people are singled out for attacks. 9. Who benefits from keeping bullying a secret? B. The bully is the only person who gains power from keeping abuse a secret. Talking about the abuse will destroy that power. 10. True or False? Bullies are unpopular and have low self-esteem. False! Bullies often have excellent social skills and lots of friends. They know how to use their behavior to gain power over others. 11. True or False? It’s easy to spot a bully at school. False! Anyone can be a bully. Bullies usually behave in a friendly way at first, and only cross the line when they know they can get away with mistreatment. 12. True or False? Sometimes bullies become targets, and targets become bullies. TRUE! People switch roles all the time. Bystanders can also become bullies or targets. This is part of the reason why bullying is so difficult to eliminate at school. 13. True or False? There are many different types of bullying, and sometimes it’s confusing to know what is and isn’t bullying. True! Bullying comes in many forms: teasing, stealing, spreading rumors, name-calling, insults, leaving someone out, damaging property, threats, cyber-threats, physical abuse. If you’re not sure about something, talk to a trusted adult. False! Anyone can be a bully. We all make mistakes sometimes. Denying the problem gives more power to bullies. Kindness and forgiveness are the solution. 15. True or False? Punishing the bully is not always the best solution. TRUE! Punishment might continue the cycle of abuse in some cases. It’s always a good idea to investigate the reason for a behavior: together, we can turn it into a win-win. 16. Max told Mrs. Hill that he was uncomfortable with Aidan’s behavior during recess, but Mrs. Hill said that she did not see what happened. The next day at recess, Max and Aidan get into a fight, and Aidan gets a black eye. Max says that he had no choice, because no one would help him. Is Max right? No! It is never OK to use violence. If one adult is unable to help you, go to another adult, and another, and another, until you get the help you need. Ask another student to stay with you if you feel vulnerable. Keep telling the bully to leave you alone, and keep asking for help. 17. Emily does not have any friends. The girls in her class do not talk to her, and the boys make fun of her. Is Emily being bullied? YES. Being left out of conversations all the time is a form of bullying. Being the target of teasing from a whole group is also a form of bullying. 18. Billy has a habit of grabbing things from other people and starting arguments. Sometimes he says to other students, “I’m going to kill you!” But he always says he’s just joking. Is this bullying? NO! Billy’s behavior is inappropriate, but he does not have one specific target. He is looking for attention from everyone. His teacher and classmates can refer him to the school social worker, for the help he needs. 19. Josh stops by Dylan’s desk every day to chat and see if he has any new books for silent reading or gear for recess. When Dylan asks for his property to be returned at the end of the day, Josh usually refuses, calling him “stupid” or “rude” in front of their classmates. Is this bullying? YES! Josh might seem friendly at first, but he is repeatedly taking Dylan’s property and insulting him. Josh is a classic bully. An Upstander could put a stop to this behavior and show support for Dylan. 20. Maddy wants to get to the front of the lunch line where her friends are. She shoves Katie out of her way while shouting, “Stop pushing me, Katie!” Katie is sent to time-out. Is this bullying? NO! What Maddy did to Katie was rude and mean. 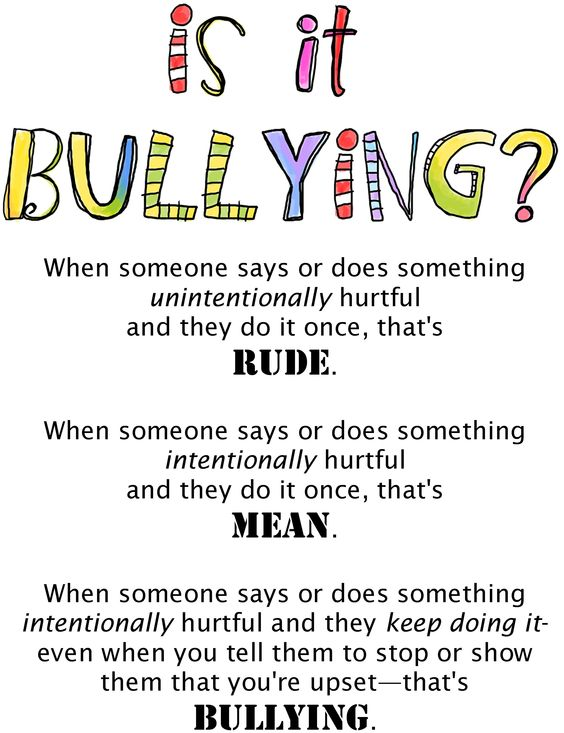 But a one-time incident is NOT bullying. An Upstander could have stopped the problem and set things right. Armed with a script and clear behavioral expectations, there’s a chance that school culture can begin to change. We cannot control the behavior of others. But we can choose our own behavior and response to unfairness. Each of us can choose to be an Upstander.